I have no doubt that mistakes like these are why Google Chrome OS netbooks will not have a capslock key. Google has gone to unusual methods to promote its new Google Chrome browser, which has become my favorite web browser to use due to how blindingly fast it is. To promote Google Chrome in tech-savvy Delhi, India, Google has taken out several billboards (or hoardings in the local parlance) to promote its product. They seem to be successful, except for one small problem. 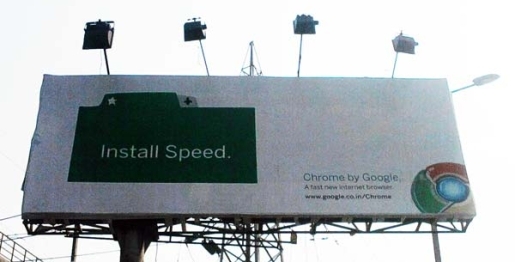 Google’s Google Chrome billboards in India feature the wrong URL. Rather than directing users to the place to get Chrome, they direct users to Google’s 404 page. The big mistake is, of course, the capitalization. The correct URL for Google Chrome India is http://www.google.co.in/chrome; the address listed on the billboard is http://www.google.co.in/Chrome. That one letter off is enough to turn the URL bad, redirecting users to Google’s 404 page. Hey, it could wrongly direct you to worse places.